So I might be a little obsessed with personalizing things… I admit it! 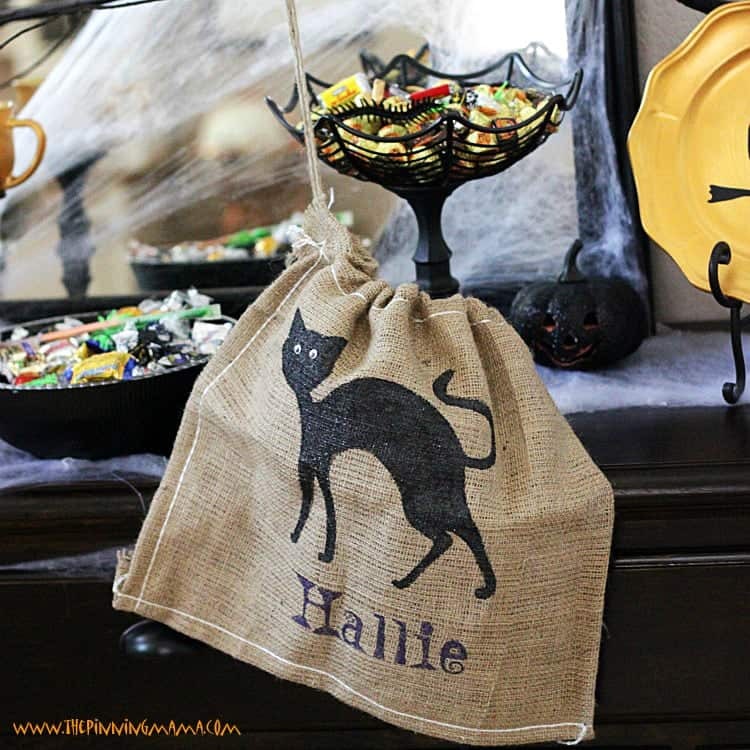 Ever since I saw my friend Melissa’s adorable monogrammed Pottery Barn Trick or Treat bags she ordered for Halloween last year, I have had it on my to-do list to make some personalized candy bags of my own. Last week we did a cool makeover on a $1 Halloween Pumpkin, but this week we are going to do something a bit more shabby chic! This adorable bags ended up to be super easy and were done in only about an hour. The best part is that it cost less than $5 to make!!! I love all things burlap and since Fall just begs for burlap I decided that the rustic look would be perfect for these cute bags. BurlapFabric.com is like the mecca of all things burlap so that is where I went to look first. They never disappoint and I found these fabulous rustic 16″x16″ burlap bags for under $2! I got in contact with them and they were nice enough to supply two of them so I could share these with you! Add some fabric paint kindly provided by DecoArt and a stencil and you have everything you need to get started! To start I found clip art of the images I wanted to paint and turned them into stencils in the basic Silhouette software, then used my Silhouette to cut out the stencil on cardstock. If you like my designs you can download my Silhouette Cut File for free at the bottom of this post. 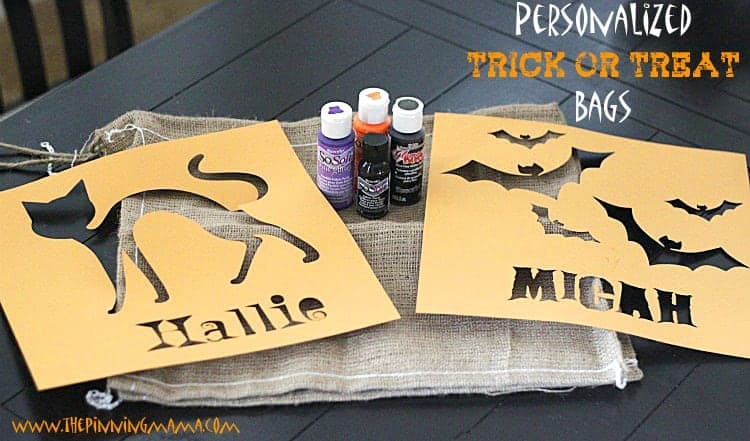 If you don’t have a Silhouette you can always print out the design and use a craft knife to cut it out, or use a stencil or stamp you find at the craft store. Once you have your stencil, you can center the design where you want it on the bag and trace the design fully with the Sharpie. Once it is traced use your DecoArt SoSoft fabric paint and your small paint brush to fill in the designs. Make sure you put some paper inside the bag to stop any excess paint from leaking through to the other side. I knew I wanted both the the designs on my kids bags to be black but I wanted the names to POP, so I painted them in bright coordinating colors. I loved using the DecoArt SoSoft Fabric paint because it really does dry soft and flexible so that the bags look great while being used but also fold and store nicely. The sharpie worked fantastically on this project because it blended into the black, but has the the ability to have fairly exact edges, and served as a perfect contrasting outline on the lighter colors I used on the text. I added a second coat of black glitter to my designs, well, just because I love glitter and think everything should sparkle a little! I used DecoArt Glamour Dust Glitter in Black Ice. I am simply put- in love with that stuff. I was worried at first because when I painted it on top of the black SoSoft fabric paint it looked really gray, but as it dried it got jet black and the fine glitter that showed up was so perfect! Just the right amount of sparkle without being obnoxious! After you let your paint dry, all you need to do is glue on a couple of googly eyes to your creation to give the critters a little life and you are set! 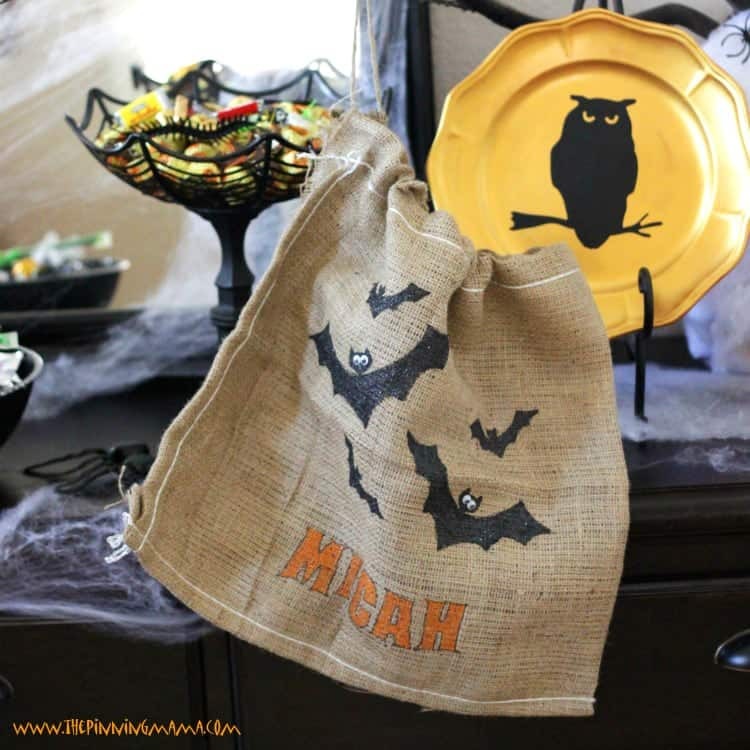 I loved this quick and easy project, but better yet, my son LOVES his Halloween candy bag! He keeps running around saying “I love my bat bag!” and “Bats are my favorite Mommy! I love bats!” I am not too sure about that last one, but hey– it’s nice to be appreciated! What are your little people going to be this Halloween? Download the Silhouette cut files I used for this project free here! Don’t forget to stop by and like us on Facebook and follow us on Pinterest to keep up with all the freebies and fun projects we create! Oh my gosh! 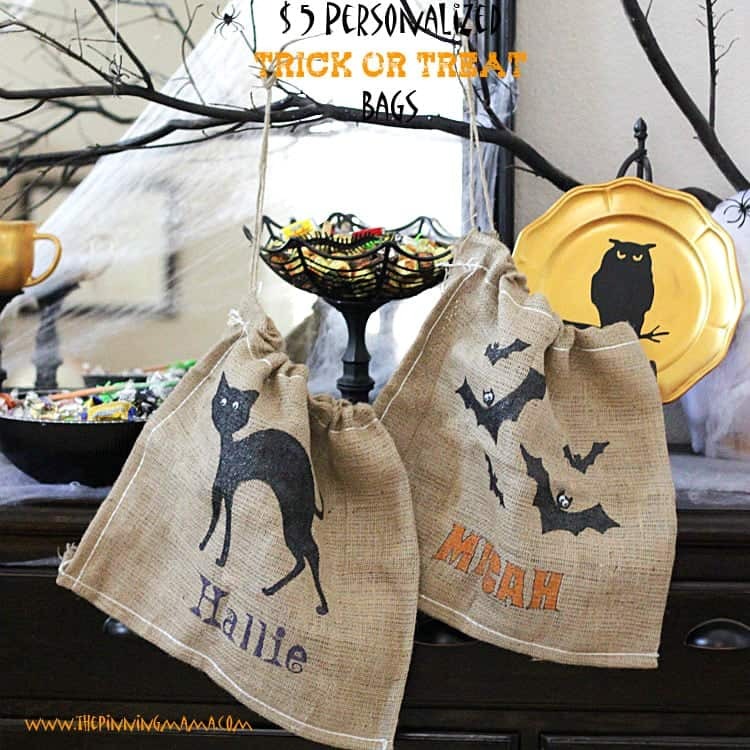 I love these cute burlap bags for trick or treating! Fun personalizing them. Thanks for the free download. Anytime! Thanks for the kind words! Love these burlap bags! They are so much fun, super cute! Thanks Jen! I can’t help but personalize everything in sight haha!